FACT: Americans overwhelmingly want Trump to be pushed out of office by a Democrat in 2020. BUT: To defeat Trump, Democrats NEED to invest a historic amount of time, energy, and resources to boost Voter Turnout. We&apos;ll be blunt: If Democratic leaders DON&apos;T invest in grassroots field organizing in 2020, Trump will stay in power for another FOUR YEARS. We WILL NOT let Trump cling onto power anymore. So it&apos;s critical that we, the people, demand Democrats get each and every Anti-Trump voter out to the polls to save our Democracy. Now, we&apos;re scrambling to gather signatures from Top Democrats across the country. 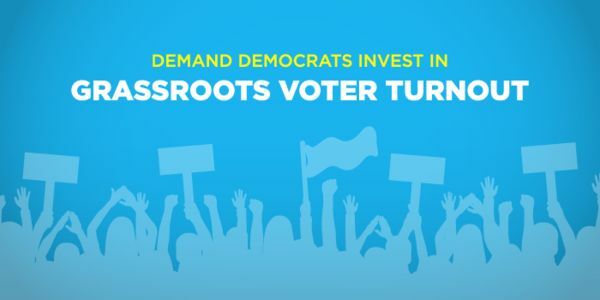 Sign now to demand Democrats invest in Voter Turnout.